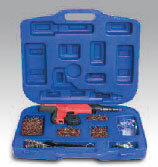 PRODUCT: Powers Fasteners P3500 Powder Tool (Deluxe Kit). Price/each. * Shipment / Delivery to Credit Card Billing Address only. * Signature by cardholder on delivery required (with Photo ID). * Shipping on our UPS account only. * Shipping leadtime 1-2 days. The P3500TM is a low velocity, semi-automatic .27 caliber tool which can be used to install .300 head drive pins, 8mm head drive pins and 1/4"-20 threaded studs, up to 3" in total length. 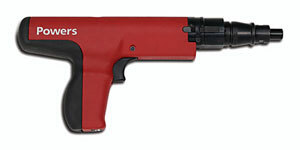 The P3500TM is designed for high speed, durability and repetitive volume applications. Powers Fasteners .300 Head Drive Pins, 1 inch. 100/Box. 50 Boxes/Case. Price/BOX of 100. (Order full cases for discounts). Powers Fasteners .300 Head Drive Pins, 1/2 inch length, Knurled. Price/100. Powers Fasteners .300 Head Drive Pins, 1-1/2 inch long. 100/Box. 10 Boxes/Case. Price/BOX of 100. (Order full cases for discounts). Powers Fasteners .300 Head Drive Pins, 1-1/4 inch. 100/Box. 10 Boxes/Case. Price/BOX of 100. (Order full cases for added discounts). Powers Fasteners .300 Head Drive Pins, 3/4 inch. 100/Box. 50 Boxes/Case. Price/BOX of 100. (Order full cases for discounts). Powers Fasteners .300 Head Drive Pins, 3/4 long, Black finish. 100/Box. 50 Boxes/Case. Price/BOX of 100. (Order full cases for discounts). Powers Fasteners .300 Head Drive Pins, 5/8 inch Length, Knurled. Price/100. Powers Fasteners .300 Head Drive Pins with 7/8 in. Washer, 2 in. Shank. 100/Box. 10 Boxes/Case. Price/BOX of 100. (Order full cases for discounts). Powers Fasteners .300 Head Drive Pins with 7/8 in. Washer, 2-1/2 in. Shank. 100/Box. 10 Boxes/Case. Price/BOX of 100. (Order full cases for discounts). Powers Fasteners .300 Head Drive Pins with 7/8 in. Washer, 3 in. Shank. 100/Box. 10 Boxes/Case. Price/BOX of 100. (Order full cases for discounts). Powers Fasteners .300 Head Drive Pins with 7/8 in. Washer, 1 in. Shank. 100/Box. 10 Boxes/Case. Price/BOX of 100. (Order full cases for discounts). Powers Fasteners .300 Head Drive Pins with 1-1/2 in. Washer, 1 in. Shank. 100/Box. 10 Boxes/Case. Price/BOX of 100. (Order full cases for discounts). Powers Fasteners .300 Head Drive Pins with 7/8 in. Washer, 1-1/4 in. Shank. 100/Box. 10 Boxes/Case. Price/BOX of 100. (Order full cases for discounts).